The Ducks battle to keep Muddy River from crossing the try line during their 44-7 win in Clinton on Sept. 1. This weekend the Iowa City Ducks will look to stay undefeated as they head to Omaha for their third game of the 2018 Fall Season. The Ducks started the 2018 Fall Season with a 36-17 win over Des Moines. Strong play put the Ducks up in the first half and the Flock was able to hold on through the second to come out with a victory. The following week’s match in Clinton was a mirror image of the one against Des Moines. Muddy River fought hard and were ahead for a good portion of the first 40 minutes. But the Ducks struck back in the second half, turning the match into a track meet Muddy River’s big men had no chance of winning. Iowa City would walk out of Clinton with a 44-7 victory under their feathers. The Ducks will try to continue their unbeaten streak as they head to Nebraska to face the Omaha GOATS, a new addition this year to the Iowa D-3 division. The Ducks fly after a loose ball at Whiskey 10s in Chicago. The Ducks went 2-2 in Chicago at the South Side Irish's annual Whiskey 10s tournament on Saturday, March 10. It was an opportunity for three of the newest Duck's players to get a chance to get some playing time with the team. Jacob Hillyer came in and scored multiple tries throughout the day. The newest pack player — Jordan "Tuna" Stern came in and anchored the scrums well. Braden Nelson impressed at breakdowns. Next up, the Ducks start Spring practice and will play the Peoria Pigs in Peoria on April 7. The Ducks after getting second place in the Midwestern D3 Championship. It came down to a last minute score. That was all that stood between the Ducks and moving forward into the playoffs: a last minute try by Fort Wayne. The only loss of the season would also be Iowa City's last game until the Spring. Despite the heartbreak, the season was still a success. The Ducks did a full 180° from 2016 — when they didn't win one game — to go 7-1-1 in 2017. "We have to remember what helped get us from 0-6 last year to a Midwest Championship game," Duck's Captain Ty Carew said. "We earned everything from the hard work, dedication and sacrifices that every guy made." Carew said the Ducks would do everything they could to get back to Midwest Championship in 2018. "We put together an excellent season and every one of us had something to do with that," he said. "In the off-season we need to build on our strengths and correct our weaknesses." Until the Spring Season starts, the Ducks will be training hard, working at Beat the Bitter in North Liberty and hanging out at Grizzly's, Deadwood, The Dublin Underground and other various sponsors around town. Looking for ways to support the Ducks? Can't find that perfect gift for the rugby player in your life? Head to The Ducks Shop for all your waterfowl-related rugby needs. 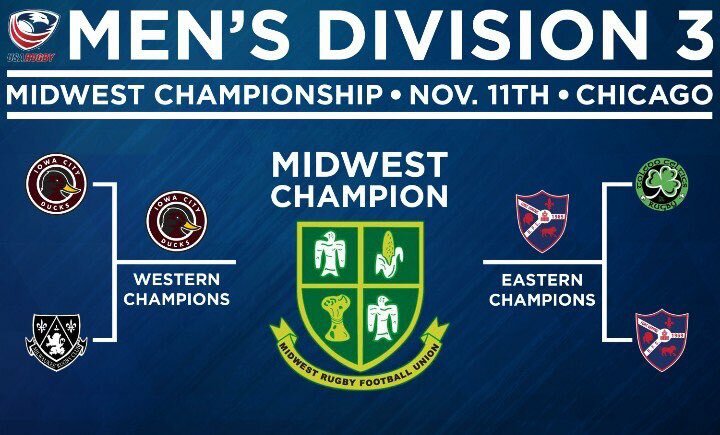 The Ducks will face the Fort Wayne Rugby Club in Chicago on Nov. 11 for the Division 3 Midwestern Championship. The Iowa City Ducks are headed to the D3 Midwest Rugby Championship on Nov. 11 in Chicago after a wild weekend of rugby in Iowa City. 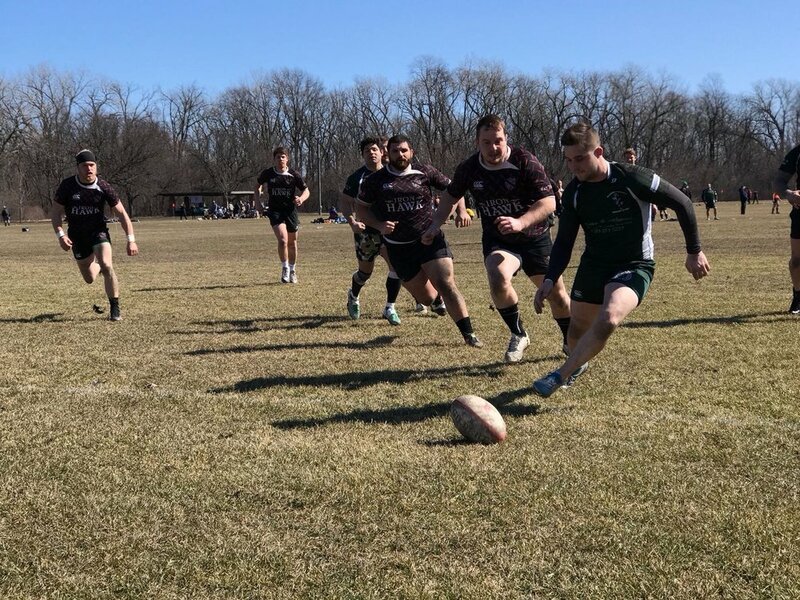 On Saturday, The Ducks faced Wisconsin RFC. As was the case for most of the season the Ducks found themselves down at half, but came out in the second half ready to roll. There was some confusion after the match, as the official had a different score down than scorekeepers on the sideline. The Ducks wouldn't know if they had won or not until almost 9 p.m. Saturday night, when it was decided by the Midwestern Rugby Union the Ducks had won. Their reward? 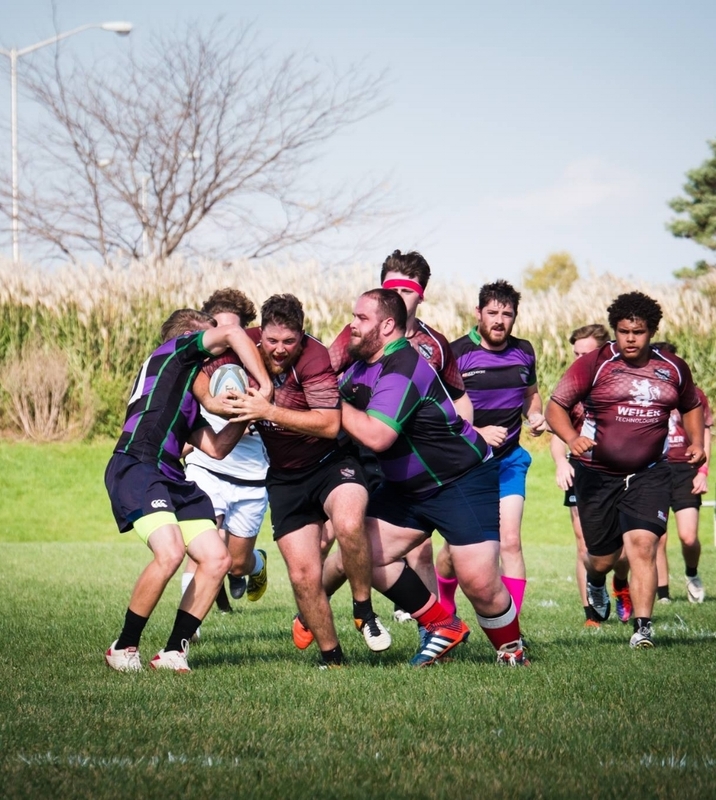 A match-up with Milwaukee RFC on Sunday for the West Division Title. Milwaukee played with heart and a powerful pack, but it wasn't enough to take down the flock. Key runs by the Iowa City backline set a tone that Milwaukee was simply unable to match towards the end of the match. The match was a battle, but in the end the Ducks managed to escape with a win and a spot in the Midwest Championship. The Ducks will face the Fort Wayne Rugby Club on Nov. 11 in Chicago. No matter what the result of that match is, it's undeniable this season has been one to remember for the Boys from Iowa City. Going from 0-5 a season ago to playing in the Midwest Championship isn't easy for any team or club, but the Ducks have pulled it off with a style all their own. The Iowa City Ducks will play Fort Wayne at 11:00 a.m. for the Midwest Division 3 Championship. The match will be held at the Chicago blaze rugby pitch at 13011 W Smith Rd, Lemont, IL 60439. Of course none of this would be possible without the Duck's sponsors who have supported the club and helped make this season possible. On Saturday the Ducks flew North to Decorah, IA to battle the Northeast Iowa Barbarians. The match was tight the entire first half with the Barbarians trailing by only 3 at the break. In the second half the Ducks proved to be too much for the Barbarians to handle. Ducks finished the match winning 58-26! Next Saturday the Ducks fly east to Clinton, IA to battle the Clinton Muddy River Rugby Club. Ducks Heading to All Iowa! This weekend the Ducks will travel to Iowa Falls for the Annual All Iowa Tournament! Matches will begin around 8 am and last until about 5 pm. We will be actively updating scores and pictures on our Twitter and Facebook pages.